Salamotov's TRIZ Textbook has been translated from English into Japanese and published as Volume 5 in the Nikkei BP' s TRIZ Series. Nakagawa served as the supervising translator in collaboration with seven members of the Mitsubishi Research Institute's TRIZ team (namely, Masatoshi Hotta, Yuji Shindo, Yoshihisa Konishi, Hideyuki Okabe, Yoshiki Shimizu, Nobuyuki Togashi, and Yasuhiro Okubo). Through the translation work we have found that this Salamatov's textbook is written amusingly and attractively for beginners, instructively and systematically for TRIZ students, and even deeply and philosophically for expert TRIZ practitioners. We hope this Japanese Edition becomes the standard for TRIZ studies in Japan. In this English page of our Web site "TRIZ Home Page in Japan", we are happy to be able to post the following materials under the permissions of the original author, Insytec, and Nikkei BP. We hope you find them useful for reading the English Edition as well. I am very glad that the book is published in Japan. This fact is even more meaningful to me than English-language edition of the book which appeared in 1999. According to a popular in Russia version, among several factors which can explain success of Japanese industrial corporations one important factor is that these corporations adapted a system of inventiveness and improvement of technology and manufacturing developed in the USSR. I am not sure that this fact is correct, but I am convinced that the use of TRIZ will lead to the next step in organization of nation-wide system of education and further industrial success in Japan. I have been involved to activities related to the TRIZ development during 28 years of 45-year history of TRIZ (the first article on TRIZ was published in the Soviet journal “Questions of Psychology”, No 6, 1956). In 1973, when I was a graduate student in Moscow, I bought the book of Altshuller “Algorithm of Invention” (“Algorithm Izobretenia” in Russian, Moskovski Rabochi, Moscow, USSR), and since that very moment I had became a faithful follower of this book during my entire life. But my first encounter with TRIZ occurred even earlier: in 1961, when I studied at school, I noticed the book of Altshuller “How to Learn to Invent” (“Kak Nauchitsia Izobretat” in Russian, Tambov Book Publishers, USSR) at the booth which presented new book releases at the Krasnoyarsk Regional Library. I was surprised with the title of the book: how it is possible to learn to invent since the ability to invent is a gift of nature! Either it is given, or it is not. The book startled me with its contents: it presented inventive principles together with real-life problems and answers which were real inventions. But at that time I invented nothing since I did not have technological problems and did not know technology. In the 70th, many TRIZ researchers in the USSR joined efforts. In 1980, my involvement to developing TRIZ became systematic within the Public Laboratory of the Theory of Inventiveness chaired by G. Altshuller. My work included development of the Guide to chemical effects, participation in the training seminars conducted across the country and conferences of the TRIZ developers, creation of the card collections for my future books, and practical inventive work (since 1983 I chaired a department at the technical university). In 1984, I wrote my first large manuscript titled “Idealization of Technical Systems” (“Idealisatsia Technitcheskyh System” in Russian). In 1987, the book “Feats at the molecular level. Chemistry helps to solve difficult technical problems” (“Podvigi na molekuliarnom ourovne. Khimia pomogaet reshat’ technitscheskie zadachi” in Russian) was published, which presented chemical effects. In 1990, the largest publishing company in Moscow "Prosveschenie" printed another my book “How to Become an Inventor” (“Kak Stat’ Izobretatelem” in Russian). This book became a big success. 100.000 copies of the book were sold out within two months! This was peak of TRIZ popularity in Russia and the USSR. According to the opinion of G. Altshuller, this title was the best TRIZ textbook. At that time, more than 200 TRIZ schools existed in the USSR, where more than 7000 students were trained. The results of the training were impressive: more than 11.000 patent applications were submitted by the students. In 1991, another my book “A System of Laws of Technology Development” (“Systema Zakonov Razvitia Tekhniki” in Russian) was published. Unfortunately, economic and industrial crises which occurred in the early 90th, restrained further evolution of the theory of inventiveness. No demand in TRIZ by the Russian industry was observed any longer. As a result, TRIZ gradually moved to educational organizations, to schools and universities. But I believe that this indicates a new step in the theory evolution! This book is a translation of the English-language edition of the title “How to Become an Inventor”, which by the moment of English translation was revised, edited and extended, and includes a fragment from the book “A System of Laws of Technology Development”. I endlessly thankful to the outstanding promoter of TRIZ in Japan, Professor Toru Nakagawa, who jointly with his hard-working colleagues Mr. Masatoshi Hotta, Mr. Yuji Shindo, Mr. Yoshihisa Konishi, Mr. Hideyuki Okabe, Mr. Yoshiki Shimizu, Mr. Nobuyuki Togashi, and Mr. Yasuhiro Okubo from Mitsubishi Research Institute performed a giant work on the translation and thorough revision of the text. I wish creative success and great inventions to all readers of the book! I am very pleased that you decided to open this book. I am sure that reading this book will be a very useful and enriching experience just as it happened to me. My journey to the TRIZ world has began in 1987, during my study of computer science and technology at the university. I was always fascinated by the miracle of invention and wanted to invent myself. I attempted to make inventions. And I was totally frustrated with my results. After numerous trials and errors I came to the conclusion that creativity is a gift, and I was an unlucky person because I did not possess such a gift. But a few years later everything changed after I joined the Artificial Intelligence group at the same university, headed by Dr. Val Tsourikov. The group attempted to build software for automated inventive problem solving. It was there where I learned about and mastered my practical skills with TRIZ. And only after I had started to learn TRIZ seriously, I realized that I was acquainted with TRIZ much earlier, when I was 12 years old! At that time, I used to read a “serious” newspaper published for children of my age, and at the last page of the newspaper was a column dedicated to non-trivial problem solving. I remember my astonishment when following “problem solving principles” described in the column I solved problems presented there rather quickly while the problems seemed to me absolutely unsolvable before! Only 10 years later I learned that the author of the column was Genrich Altshuller, originator of TRIZ. During my entire professional career, I have been assisting customers in solving inventive problems in different areas of business and technology. And almost every time ideas found by us with TRIZ resulted in new breakthrough solutions. Knowledge of TRIZ helped me and my customers to solve problems in the areas of microelectronics, telecommunications, ship building, food industry, space technology, precise manufacturing, optical industry, software engineering, business processes, even corporate mergers… And the list continues. Why is it possible? The answer is simple: TRIZ radically changes the way we see and solve problems. TRIZ unlocks hidden capabilities of our brain to create new ideas on demand. Knowing TRIZ, there is no need to be afraid of contradictions, which are the major obstacle on the way to breakthrough solutions. TRIZ is not a number of tricks: on the contrary, it is a systematic, structured methodology of solving non-ordinary problems drawn upon strong scientific background. This background was created by joint efforts of hundreds of researchers who dedicated themselves to studying patent collections, revealing and formulating general principles of invention and who discovered that evolution of technology is a systematic process which can and must be studied. Undoubtedly, modern TRIZ is the dawn of a new science. A science of invention and creativity. And, just as physics, this science can be learned and used by any person no matter how “gifted” he or she is. By the moment when I obtained the book of Dr. Salamatov in 1991 (as a part of my post-academic education in TRIZ), I had been already familiar with a number of books presenting TRIZ and available from other authors. But what really amazed me was the clarity of the message contained in his book. Probably, this book was not the easiest one to read, but it was the text where I found answers to questions I could not find anywhere else. Later, I met Dr. Salamatov in person, and we developed friendly professional relationship. I was always astonished by his ability to express very difficult subjects in a very clear and understandable language. Training others in TRIZ and Knowledge-Based Innovation is a part of my professional activities. When delivering my TRIZ courses in English in the past, I always had a strong feeling that something was missing. No matter how accurately I was trying to explain the theory and its practical applications, I always felt that a good and comprehensive textbook for after-course reading is something every student of mine must have in possession. I often thought about writing such a book myself. But when I got a chance to translate and publish a book on TRIZ in English, I had little doubt which book to choose, and there was no need to write the book myself since such textbook already existed. Although by that time I had became familiar with more than 20 titles presenting TRIZ in Russian, my decision to choose Dr. Salamatov’s book was based on three factors: clarity, most updated coverage of the subject, and excellent selection of examples illustrating practical applications of the theory. Probably, it would be more chronologically correct to select one of the Altshuller’s books, but my decision was based solely upon the practical requirement: my students needed a book which would clearly present not only TRIZ fundamentals but also provide solid explanation of how to put TRIZ to use, since most of them were practicing engineers and managers. Dr. Salamatov accepted my request to publish his book immediately and provided me with updated and revised edition of the original Russian-language book the same day. I am very thankful to him, our translators and editors for their cooperation during really hard editing and translation work we did all together to bring this book to life. The English-language edition of the book has been a success. Most of the readers consider the book to be the best among other TRIZ publications available in English. We are very proud of this fact. The book is also distributed at training courses given by TRIZ professionals worldwide. We strongly believe that our book helps the readers not only to solve problems, but also to decide if organizations where the readers belong to need to introduce TRIZ as a part of their innovation strategy. No doubt, one day we will notice that TRIZ penetrates virtually every area where technological and business creativity is needed. In the modern economy, which values intellectual property extremely high, the ability to solve inventive and innovative problems becomes a crucial factor influencing success of enterprises and wealth of society. Already today, we can observe how the most innovative organizations introduce TRIZ, train their staff, and train their own TRIZ trainers and consultants. If you want to learn what TRIZ is and how to use it, reading the book will be of a great help to you. The book will provide you with a basic understanding of underlying TRIZ principles which are necessary to know if you want to use TRIZ effectively. If, after reading the book, you would like to further extend your knowledge of TRIZ, I strongly recommend you to visit professional TRIZ training courses, where you can master your skills under guidance of professional TRIZ trainers. Modern TRIZ is a large body of knowledge, and it was not possible to present everything in a single volume. At the same time we believe that our book is a basic tool which will help you to start solving problems that you perhaps considered too difficult to attack in the past. This book is a result of joint efforts of several dozens of people. I would like to express my gratitude to Mr. Tsukasu Sinohara, Dr. Toru Nakagawa, Mr. Masatoshi Hotta, Mr. Yuji Shindo, Mr. Yoshihisa Konishi, Mr. Hideyuki Okabe, Mr. Yoshiki Shimizu, Mr. Nobuyuki Togashi, and Mr. Yasuhiro Okubo, and everyone involved for their efforts to bring this book to Japan. I have no doubts that this book will have a significant impact on further increase in the intellectual capital of your country, just as we have already seen TRIZ reshape the world we live in by making it real to create a better life on demand. 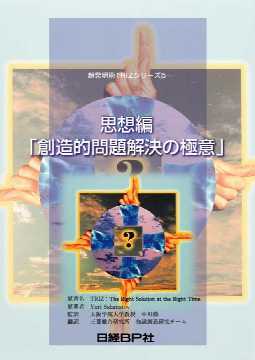 The Russian born "Theory of Creative Problem Solving" (TRIZ, as pronounced like 'trees' in English) was introduced in Japan four years and half ago by the journal "Nikkei Mechanical" in its 1996 March issue. TRIZ was introduced into the West only after the end of the Cold War, and gave strong impressions as a new methodology for invention without depending on trial and errors and enlightenments. When people encountered TRIZ for the first time, some of them (including myself) were fascinated with it and regarded it as a long-sought methodology for technical innovations, while some others were skeptical of such a possibility of magical methodology for inventing. In those early days of introducing TRIZ in Japan, the available information was limited to few books authord by Altshuller, the Founder of TRIZ, around 1970 and software tools recently built in the US by ex-USSR TRIZ experts. Altshuller's books mostly described how to solve example problems, just like solving puzzles; the ways of solving were fascinating but many examples were somewhat old-fashioned. Software tools contained large knowledge bases of technological principles and interesting examples and installed easy-to-handle user interfaces; but they were supplied without enough instruction of the ways of thinking and using the tools in the problem solving. To understand TRIZ in its overall perspective and to learn the TRIZ way of thinking in problem solving, available information was too much limited. Such a situation was more or less similar even in the US, where a large number of ex-USSR TRIZ experts were working as consultants and software promoters. Mostly due to the barrier against the Russian language, TRI was not, and still is not, understood widely and correctly. Many consultants thought that TRIZ, if it once introduced into industries, would promote technical innovations widely and rapidly, by virtue of its huge and deep knowledge for creative problem solving in technology. However, the penetration of TRIZ in industries is still limited. That is not because TRIZ is poor in its way of thinking, solving techniques, and knowledges, but, on the contrary, because TRIZ is so rich and deep that only fragments of it have been introduced and thus TRIZ has encountered poor undestanding, I believe. I have been thinking that a good and comprehensive TRIZ textbook is needed for studying the theories systematically and for mastering the essence of the TRIZ way of thinking. In the beginning of 1999, the English Edition of this Salamatov's TRIZ textbook was published. I bought it soon and read some chapters, but then left it because of my busy schedule just like everybody. By autumn 1999, I recognized that Salamatov's textbook described TRIZ in much more detailed and systematic way than any other textbook, and was considering to translate it into Japanese. So, on November 16 I called on the phone Mr. Tsukasa Shinohara, Vice Editor of Nikkei Mechanical Journal, and then Mr. Masatoshi Hotta, Leader of Invention Technologies Team, Mitsubishi Research Institute. My proposal was accepted by them immediately, and we decided to make and publish the Japanese edition in collaboration of the three parties. All the engineering members of MRI's TRIZ team took part in translating the textbook from English to Japanese chapter by chapter, and prepared their second drafts by the end of March 2000 after their group reviews. Then I revised them in detail to make the third drafts by July. They were reviewed not only by the translation group but also by a dozen of volunteer members belonging to the MRI's Users Group WG. Then I revised the whole draft again with close checking of the English edition and have just finished the forth manuscripts today. In parallel to making the manuscripts, we have been sending questions and comments by emails to Mr. Valery Souchkov, the Editor of the English Edition. Answers are coming back chapter by chapter from the Netherlands, and we are going to reflect the replies during the stages of our galley proof reading. Now at the final stage of this laborious work, we are very glad to have the chance of translating this textbook. This textbook contains a large number of anecdotes, examples, problems, and exercises; all of them make the book amuzing, interesting, and easy to understand. This book covers a very wide range of subjects; it describes theories for solving technical problems (e.g., Inventive Standards) in detail, and further introduces new aspects of TRIZ, such as the analysis of science fictions and the training of creative imagination, which have not been known well before. And above all, the book illustrates the philosophy of TRIZ in its essence by clearly explaining the laws of evolution of technical systems, the dialectical ways of thinking for creative problem solving, etc. The TRIZ methods for solving problems, about which we have been studying much so far, are the "tactics" for inventing, whereas it is more important to learn the "strategies" for inventing; TRIZ theories of evolution of technical systems form such a basis. This is one of the principal messages of this textbook, as I understand it. The theory is deep indeed, but is surprisingly simple in its essence; so once we understand its heart, we shall not forget it. Once we master the heart of TRIZ, we will be able to do technological development creatively with the TRIZ spirits in a free manner without depending too much on the details of huge TRIZ knowledge bases and problem solving methods, I believe. When you understand TRIZ in such an essence, TRIZ will penetrate into industries, businesses, and education in its spirit. In translating the texts into Japanese, we paid much efforts for correct translation, but not literal translation in its derogative sense. We do not think it fair to omit any words or phrases and to insert any without explicit discussions. Thus, any words or phrases inserted in or changed from the original English Edition (i.e. the first edition published in 1999) are shown in the brackets [ ]. They contain the ones shown as Errata by Mr. Souchkov in March 2000 (this is referred in our footnotes as "English second version" even though unpublished yet) and also the ones based on our Questions/Comments and Mr. Souchkov's Answers. Such revisions (many but mostly minor) will be posted in English in my WWW site "TRIZ Home Page in Japan" (URL: http://www.osaka-gu.ac.jp/php/nakagawa/TRIZ/eTRIZ/), together with future Errata of the Japanese Edition. Readers comments on this textbook are very welcome via Email to nakagawa@utc.osaka-gu.ac.jp. We are grateful to Dr. Yuri Salamatov, the Author, and Mr. Valeri Souchkov, the Editor of the English Edition, for their newly written prefaces to our Japanese Edition. We thank Mr. Souchkov especially for his answering to our questions and comments in detail. For reviewing our drafts we are gratful to Mr. Yasuo Suzuki, Mr. Shoichi Onagata, Mr. Atsushi Takahashi, Mr. Mitsuo Morihisa, Mr. Shigeki Muramatsu, Mr. Toshimitsu Kataoka, Mr. Hiroshi Ueda, Mr. Hiroaki Kawashima, Mr. Yuji Tanaka, Mr. Hirofumi Harazoe, Mr. Akira Takayama, and Mr. Yuji Mihara. We also thank Mr. Tsukasa Shinohara, Vice Editor of Nikkei Mechanical Journal, for his valuable assistance in editing and for accepting a number of trials for improving this edition during the tight schedule of publishing. We heartily wish that this textbook helps readers understand TRIZ correctly and achieve creative work and that TRIZ is introduced widely into industries, businesses, and education and forms new waves of technological innovations and technological education.